AHHA members include public and not-for-profit hospitals, community and primary healthcare services. Universities and other educational organisations offering courses or undertaking research in relevant healthcare related fields, peak bodies and associations representing the interests of Australia’s universal healthcare system and individuals who are practitioners, employees within a relevant health field or bona fide students in a relevant field of health-related study are also welcome to join AHHA. AHHA members represent all sectors of the Australian public and not-for-profit health system advocating for universal, high quality and affordable healthcare to benefit all Australians. Membership provides the opportunity to join this community of health sector thought leaders as they grow and shape Australia's health system and gives access to a wide range of services and resources designed to help meet the challenges of this rapidly evolving sector. Our members also have access to the services provided by our academic research arm, The Deeble Institute for Health Policy Research. Full Members are organisations most closely associated with the activities of the AHHA. Full membership includes representation on the AHHA Council, the governing body which elects the board and sets the strategic direction for the AHHA and includes the opportunity to be closely involved with the development of submissions to government and other advocacy activities. Full membership of an organisation also allows all staff to access member benefits such as access to discounted events and training. There are 6 bands of full members based on the gross operating expenditure of the organisation. 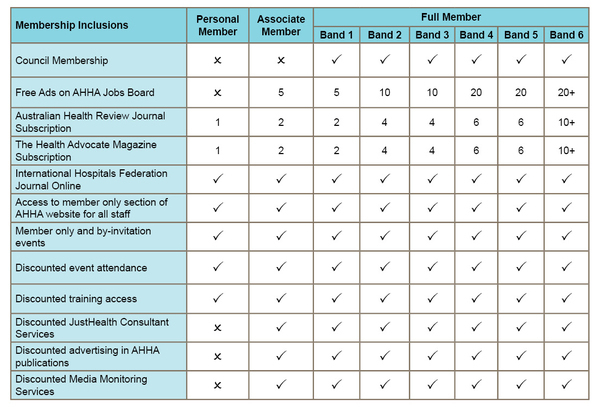 Associate Members receive AHHA publications, discounted access to events and training for all their staff but are less involved with the day to day work and advocacy of the AHHA. Personal Members receive AHHA publications and discounted access to events and training. Personal membership of AHHA is open to all individuals who are interested in the work of the AHHA and the future of Australia's universal healthcare system. Student membership is open to students currently studying a relevant health related course with a valid student ID number. Student members receive the same member benefits as personal members.